30Hz Mixtape Battle Prelude - Crawl from #Bond_age_ on Vimeo. Can you remember back when you were a kid and the greatest gift you could give or receive was a mixtape? You'd put countless hours into making the perfect soundtrack for life's experiences. Break up? Mixtape. Fall in love? Mixtape. Road Trip? Mixtape. New friend? Mixtape. The challenge of guiding the listeners mood through peaks and valleys of rare B-sides and your absolute favorites while considering the taste of your audience was a talent only reserved for the truly passionate about music. We at construxnunchux have engaged our friend from 30hz rumble to make the best possible under 45 mins. Our theme this week was Star Wars. Anything with a Star Wars lyric, sample, or song was on the plate for us to take for this one. I'm not necessarily a Star Wars fanatic but I love the music involved with it. This was a fun one to mash together finding some artists I've never heard of and some really good mixes. Once you listen to both playlists; Your job is simple just vote below for which one you enjoyed better. The winner this week gets the puppy they've always wanted for Xmas so please vote with your heart. It is a period of Mixtape ambivalence. 30Hz, striking from 12-track playlists on 8Tracks and Spotify, has won minor victories against the evil galactic iTunes empire of mindless streams of music. 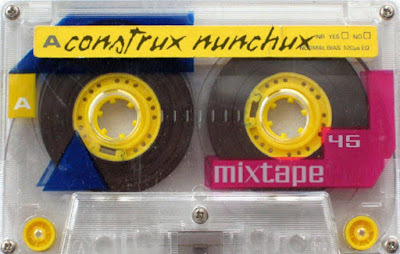 During the one-sided battle (that iTunes never even noticed), 30Hz managed to steal the attention of ConstruXNunchuX blogger, Paul Clemente, who challenged 30Hz to a mixtape battle that could bring balance to the universe... or at least Pittsburgh... but probably nothing will happen. Pursued by the "evil" agents from iTunes and probably Pandora, ConstruX and 30Hz comb through every Star Wars-related song they can think of to save the Mixtape and restore musical awareness to the Galaxy. The following tracks cover or sample Star Wars music and/or contain goddamn catchy lyrical references to the Star Wars galaxy. May the force be with 30Hz and ConstruX NunchuX. Who has the better mixtape?